I don’t get tired of viewing the Toy Story, because I am thrilled by the fantastic friendship of the toy cowboy Woody, and toy astronaut Buzz Lightyear, after a bitter encounter and they later become inseparable buddies leading other animated toys in different adventures. In between the lines of the Toy Story are lessons of our life on earth. I regard it as one of the best animated movies for children. I would love to see a production of the Toy Story with real people playing the roles of Woody and Buzz. Toy Story 3 coming out on the 18th of June, 2010 will be one of the must see films in summer. BURBANK, Calif., February 23, 2010 /PRNewswire/ — This Spring, Walt Disney Studios Home Entertainment (WDSHE) proudly presents the eagerly awaited high definition debuts of Disney•Pixar’s original animated classics Toy Story and Toy Story 2. In 1995, Toy Story made history as the first feature-length computer animated film and, together with its beloved sequel Toy Story 2, helped establish Disney•Pixar as creators of unrivaled quality family entertainment. Now, viewers can rediscover these wondrous tales of what happens when humans leave the room – and toys come to life – as Toy Story and Toy Story 2 debut on Disney Blu-ray™+ DVD Combo Pack, followed seven weeks later by the Special Edition DVDs. For the first time ever, these two groundbreaking films will be presented with eye-popping 1080p high definition picture and 5.1 DTS-HD Master Audio sound, along with hours of innovative new bonus features. Also included are exclusive sneak peeks at Disney•Pixar’s Toy Story 3, hitting U.S. theaters on June 18, 2010. Academy Award®-winner John Lasseter (1996, Special Achievement Award, Toy Story), directs these two action-packed, laugh-filled animated favorites featuring the superstar voice talents of Tom Hanks (Angels & Demons) and Tim Allen (The Santa Clause), along with Don Rickles (Casino), Annie Potts (Ghostbusters), Wallace Shawn (The Princess Bride) and, of course, Pixar favorite John Ratzenberger (TV’s “Cheers”). Together, Toy Story and Toy Story 2 launched the Disney•Pixar label and sent audiences to the infinity of family entertainment fun and beyond…as they’re sure to do once again on Blu-ray™. Episode One: Blast Off – Buzz reports back about his adventure to the International Space Station. Paths to Pixar: Artists – In this series of shorts, Pixar artists talk about their career path and share advice to aspiring filmmakers and animators. Studio Stories: A series of amusing anecdotal shorts about life at Pixar. “John’s Car” recounts how Toy Story director John Lasseter refused to stop driving his beat-up car even after the film’s success. “Baby AJ” tells the hilarious story of how important Halloween is to the Pixar team and how one Pixar employee dressed up as the oversized baby from the short Tin Toy to win a prize. “Scooter Races” takes the audience on a rousing scooter race around the studio with John Lasseter and other employees. Buzz Takes Manhattan – Spectacular footage from Buzz Lightyear’s premiere as a Macy’s Thanksgiving Day Parade balloon. Black Friday: The Toy Story You Never Saw – The Toy Story filmmakers discuss the early cut of the film that very nearly shut down production entirely. Episode Two: International Space Station – Buzz reports back about his adventure to the International Space Station. Paths to Pixar: Technical Artists – In this series of shorts, Pixar artists talk about their career path and share advice to aspiring filmmakers and animators. “Toy Story 2 Sleep Deprivation Lab” gives audiences an inside peek into the intense time pressures under which the Toy Story 2 editors found themselves. “Studio Stories: Pinocchio” shows an impromptu competition between the animators to decorate their workspace by throwing toys into the ceiling. “Studio Stories: The Movie Vanishes” tells how a mischievous technical error almost erased all of Toy Story 2 from the computer system. Pixar’s Zoetrope – A look at the creation of the live-action zoetrope that Pixar created to capture the principles of animation in a live sculpture. Celebrating our Friend Joe Ranft – A tribute to beloved Disney and Pixar story man Joe Ranft, regarded as one of the industry’s most gifted story artists. Toy Story, the first full-length computer-animated feature film, is “a wonder to behold.” – People Magazine. Experience a hilarious fantasy about the lives toys lead when they’re left alone. Woody (voiced by Tom Hanks), an old-fashioned cowboy doll, is Andy’s favorite. But when Andy gets Buzz Lightyear (voiced by Tim Allen) for his birthday, the flashy new space hero takes Andy’s room by storm! Their rivalry leaves them lost with a toy’s worst nightmare — Sid, the toy-torturing boy next door. Woody and Buzz must work together to escape, realizing along the way that they’ve got a friend … in each other! 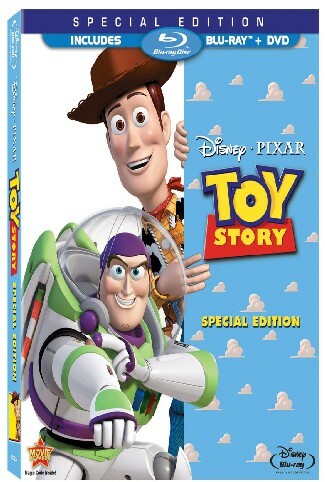 The Toy Story and Toy Story 2 Blu-ray™ + DVD Combo Packsare priced at an SRP of $39.99. The Special Edition DVDs are priced at an SRP of $29.99. To provide consumers with unprecedented quality, value and portability of their favorite Disney movies, in 2008 WDSHE pioneered the Combo Pack – a Blu-ray Disc™ plus a DVD and a DisneyFile Digital Copy of the film in a single package. Current Disney-branded titles available as Combo Packs include High School Musical 3, Beverly Hills Chihuahua, Bolt, Bedtime Stories, Race To Witch Mountain, Jonas Brothers and Hannah Montana The Movie.